This week’s new discovery coffee shop is the cute little Lili & Oli in the St-Henri neighborhood. I have walked by this place a couple of time, but it has always been packed of people, so I kept on walking… Mind you, it was always during weekend rush hours, so I attributed it to being the local it spot to grab your cup of coffee and catch up with friends. I officially set foot in the coffee shop a couple of days ago, along with a friend and her puppy. Yup, you read it, this is a coffee shop that is pet friendly! Mind you, you may not get much work done: either you’ll want to be petting all the cute puppies that come in, or your dog will be the center of attention. 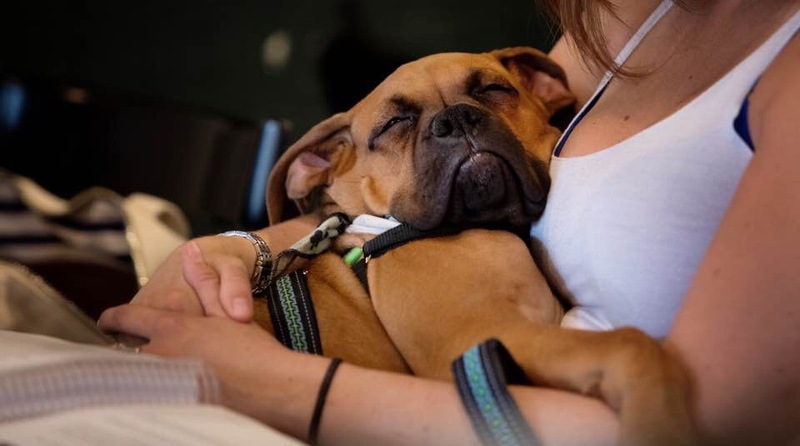 Mister Winston, my friend’s cute little 4 month old Boxer, stole the show. The coffee shop itself is very minimalistic; white walls with some photographs, which I presume might have been from a local artist, with nice window seating, booths and table seating, and a small terrasse in the back. They serve a house blend of coffee, which was delicious by the way, as well as several other coffee based beverages, teas and drinks. You can also grab some snacks there too; the croissants they were serving looked delicious. I can’t think of a better place to go hang out with friends, stop to grab a cup of coffee on your morning walk with your dog, or go do some work and bring you puppy as your business advisor for the day. The staff is super friendly and nice, and they were totally fine with Winston when he threw a little puppy fit. Oh, I guess now’s the time to tell you, but Marie and I will definitely be coming back with our newest addition to the family! We are proud fur moms-to-be of a future little puppy! Yup, we’ve taken the plunge, and we will be introducing to you our newest blogging advisor soon enough! Loving your articles. Keep it up. Thank you! Its nice to know that someone other than my dad reads our stuff!! !